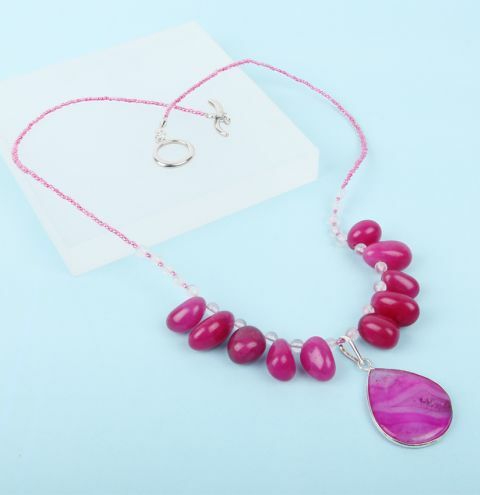 Make a semi-precious necklace for summer to add a colourful pop of pink to your outfit! This project uses rose quartz beads with NEW agate nugget beads and a unique agate pendant to match! Cut approx. 24 inches of wire. Starting from the centre of your necklace string on 3 seed beads, 1 rose quartz 4mm bead, 1 nugget. Repeat until you have 5 nugget beads in total. Then add 1 rose quartz bead, 1 seed bead until you have 5 rose quartz beads. String on enough seed beads to fill 6 inches of wire. On the opposite side, thread on your pendant to sit on top of the 3 seed beads and repeat the previous step to mirror the design. Add more seed beads to each side if you would like your necklace to be longer. Once you are happy with the length, thread the wire through a calotte and crimp bead. Take the wire back down through the hole of the calotte. Pull the wire so that the calotte sits close to the seed beads. Squash your crimp bead flat to secure the end. Trim away the wire, leaving 1 inch tail. Pass the wire tail back down the seed beads to hide in the design.